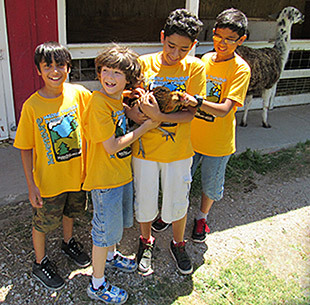 The Adventure Maine Township Summer Camp program, now in its 16th year, is open to children ages 8-13 who live in Maine Township and qualify based on family income. We have two two-week sessions each June and July. This camp provides children an opportunity to experience many cultural, educational, and fun-filled outings such as amusement parks, professional theater, miniature golf, beach party, Chicago museums, water parks, sports, games, arts and crafts, and much more. Our day camp provides a supportive and structured environment where children can improve their social skills while being exposed to new activities they may not otherwise be able to experience. Children will also benefit from interaction with qualified staff and positive adult role models. Throughout the camp we discuss important topics such as teamwork, citizenship, peer pressure, respect, responsibility, and trustworthiness. And every day is filled with fun and adventure! Cost is only $40/child and includes all activities and a camp t-shirt. To be eligible to participate in camp, household income must be at or below 300% of the Federal Poverty Guidelines (see table below). For more information please contact Anne at 847-297-2510 x272 or acamarano@mainetown.com. Add $12,540 to annual gross income for each additional person. Court ordered child support paid out of childcare cost can be deducted from these income levels if verification is included with the application.